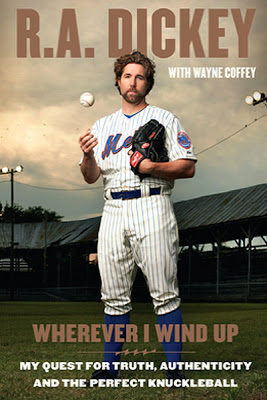 I've just finished reading R. A. Dickey's book, "Whenever I Wind Up - My Quest for Truth, Authenticity and the Perfect Knuckleball." I'd glanced through the book before the Toronto Blue Jays signed Dickey, last year's National League Cy Young award winner, but after he joined Canada's team, I thought I should get acquainted with this highly touted pitcher. Dickey chronicles his sexual abuse as a young boy and relates how the experience often came back to haunt him in later years. Dickey's upbringing was far from "normal" but through perseverance and determination he was able to overcome the demons in his life and become one of the top pitchers in the major leagues. As I read the book I found myself getting frustrated, along with the author, as he repeatedly was given chances to secure a spot in the pitching rotation of several big league clubs but was shipped back to the minors time and time again after brief appearances in the "bigs". After struggling for years to succeed as a pitcher using the usual arsenal of fastball, curve, slider, change-up, etc., Dickey took a shot at being a knuckleball pitcher, following in the footsteps of knucklers like Hoyt Wilhelm, Phil Niekro, Charlie Hough and Tim Wakefield. Finally...success became a reality, not a dream and R. A. Dickey has put together several seasons as a remarkable pitcher. If you're quick to give up on someone, you might put the book down after Dickey had been sent back to the minors countless times but if you're a cheerleader who pulls for the underdog...you'll stick with R. A. 'til the end. The book was especially meaningful to me as the author mentioned several baseball men who helped him along the way, men who impacted my life as well during my years as chaplain to the Toronto Blue Jays. Reading the book resurrected fond memories of encounters with these men. R. A. Dickey's vibrant faith in Jesus Christ undergirded him during his rise to the top. Without divine encounters with a living God, Dickey's struggles personally, in his marriage and in his baseball career would certainly have brought him down. Of the many sports biographies and autobiographies that I've read over the years, this one ranks right at the top. As the title suggests, Dickey was seeking truth and authenticity. After exposing his flaws and warts for the world to see, I sense that this man is now authentic and real. Buy the book and be challenged and encouraged.